➤ Upon arrival you will be received and transferred to the hotel by our guide. ➤ You will have an overnight stay at the hotel. ➤ After breakfast transfer to Airport to connect flight to Srinagar, On Arrival you will be met by representative and transferred to your houseboat. ➤ Srinagar City is famous for its gardens, lakes and houseboats. It is also known for traditional Kashmiri handicrafts and dry fruits. ➤ This is a place of splendid natural beauty, it's often referred to as the 'Land of Lakes and Gardens' or the 'Switzerland of India'. ➤ The Gardens of Srinagar Srinagar's extensive, well-manicured, gardens date back to the Mughal era. They're abundant with bright blooms and stunning vistas. Start with Shalimar Bagh - The Abode of Love , which Mughal Emperor Jehangir built for his wife in 1619. Next, visit Nishat Mughal, Garden of Gladness, which borders Dal Lake. It was constructed in 1634 after Shah Jahan became the Emperor of India. Head to Pari Mahal for fabulous sunset views over Dal Lake and Srinagar. On the way you'll pass the Botanical Garden, where the famous Tulip Festival is held every April, and Chashme Shahi Gardens. ➤ Overnight stay in the Deluxe Houseboat with services of a personal butler. ➤ Morning after breakfast proceed for a picturesque drive to Gulmarg. ➤ Gulmarg The Meadow of Gold, was discovered as a tourist destination by the British in the 19th century. Prior to that, Mughal emperors vacationed in the Gulmarg valley. It has one of the world's highest green golf courses with 18 holes. Gulmarg also has one of the best ski slopes in the world. ➤ After lunch proceed on a Cable Car Ride up the mountains. The Cable Car ride, popularly known as the Gondola Ride is the special attraction of Gulmarg. ➤ There are two divisions of the ride one is from Gulmarg to Kongdoori and the second one is from Kongdoori to Apherwat. It starts from an elevation of 2690 m above sea level and go up to a height of 3090 m. It finally reaches Kongdoori by passing over the wonderful pine forests below. ➤ The tourists enjoying the cable car ride get thoroughly enthralled by experiencing the magnificent sight of the greenery of the hilly terrains and the picaresque setting all around. The cable ride also overtakes the marvelous meadow of colorful flowers called Khilanmarg during its journey. ➤ Phase 1 : Travel from Gulmarg to Kangdori which is at an altitude of 10,000 (ft) above sea level. It is a thrilling journey of 5 minutes amid the sky touching pine trees and threatening mountains. ➤ Phase 2 (optional: approx Rs600/USD10) : Travel to Alpanther at a breathtaking and frightening height of 13,500feet above sea level. It is a journey of 20 minutes that ascend sharply in the rocky summit of the mountain. Sometimes the gondola even travels surpassing the clouds. ➤ p/s: Heart Patients with respiratory problems and minors below 5 years cannot go for this ride. You are suggested to take warm clothes along as the weather can be extremely cold throughout the year. ➤ a) Seven Springs- the point of origination of 7 springs and also a natural water source. ➤ b) Khilanmarg which is a wide meadow covered with flowers and takes 30 minutes to reach on pony. ➤ a) A bird's eye view of the lovely Kashmir Valley. ➤ b) Alpanther Lake that is A continually frozen lake throughout the year. It's a 30 minutes walk from the peak of phase-II. ➤ c) Rare Flowers: Rare flowers can be seen on the way while walking a little distance by foot. ➤ Late afternoon drive back to Srinagar. ➤ After breakfast proceed to Pahalgam, known as Heaven on Earth. Its a small place of 2-3 km but you can spend a week without getting bored. ➤ Known also as the Valley of Shepherds, this resort is set in a pristine village lying next to the Lidder River with breathtaking views. 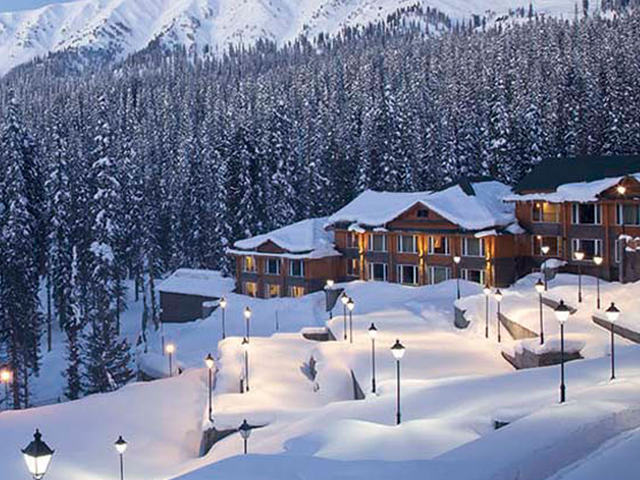 ➤ Now its Kashmir Premier Hill Resort, cool even during the heights of summer. Its situated at an altitude of 2130 m above sea level and has a golf course at 2400 meters above sea level. Surrounded with fragrant pine forests, this idyllic resort includes a golf course and spots for angling. ➤ The bubbling Lidder harbors a sizeable population of rainbow trout and mahaseer to ensure you dont come away disappointed. The nearby forested slopes are home to the Himalayan Brown Bear. ➤ After having lunch, proceed to have bridle walks and feed your cameras with the picture of magnificent view of mountains. ➤ There are many places of interest, and because the resort is set between fairly steep hills, it is worth hiring a pony rather than walking. The most beautiful of these is the huge, undulating meadow of Baisaran, surrounded by thickly wooded forests of pine. ➤ Later drive back to Srinagar. ➤ After breakfast,you will be transferred to Srinagar airport to connect flight to Delhi. ➤ Once arrived proceed for Bazaar Shopping. • 5D Delhi Agra Jaipur + Taj Mahal only RM1398 now! ★ Explore Pahalgham "The Valley of Shepherds"
★ Feel why Kashmir is known as "Paradise on Earth"